Montara Self Catering Holiday Cottage in the Lake District. A delightful Lakeland cottage in the village of Backbarrow. Montara offers cosy, well appointed cottage accommodation for up to four people and is available all year round. Dating from around 200 years ago, with beams and an open fire, the cottage enjoys views over Backbarrow Gorge. The village of Backbarrow lies on the River Leven in the Lake District National Park, just to the south west of Lake Windermere and to the south east of Lake Coniston. This is a popular area for those who prefer the "quieter" life, being away from the bustle of the central lakes, but still within easy reach of those areas. 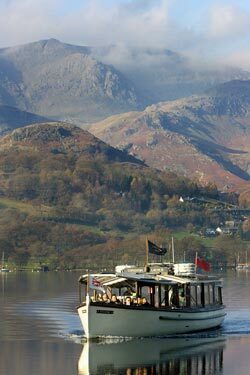 There are many local attractions including the delightful heritage Lakeside and Haverthwaite steam railway which passes behind the cottage, and the Lakeland Motor Museum which is a short stroll away. The Lakeland Peninsulars and Morecambe Bay are within easy driving distance and offer a pleasant, seaside alternative for those who tire of Lakeland grandeur. The cottage is exclusively for non-smokers (including e-cigarettes), and we cannot accommodate pets. Please note that Google Streetview for us is over 10 years old.